The fabrics, some of the thread and the batting were provided by Island Batik and their partners, Aurifil and Hobbs Batting. Welcome to my secondary pattern or are there 3 patterns here or even more? 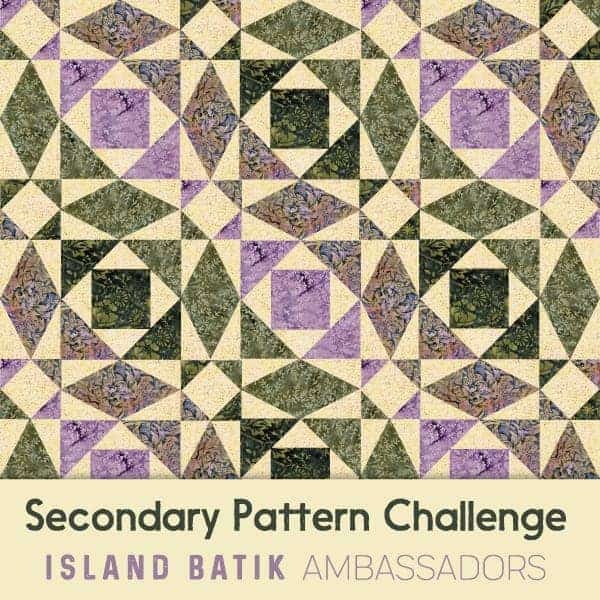 Island Batik challenged the ambassadors this month to design a quilt with a secondary pattern – Pattern Play! This logo, chosen by Island Batik, has one of my favorite patterns, Storm at Sea. I love the way you get curves by the triangles in the right place. Since the logo was leaning that way, I decided to lean another way. This was also one of my 3rd Quarter Goals, to finish this quilt. As I thought about my design, my fabric pile was dwindling, but I had the remains of the Mountains Majestry strip set and some yardage so off I went. I decided to use a Snowball block and a 9-patch friendship star. I loved the way it looked when put together. I liked the saw blade effect that became the secondary and larger design. It also allowed me to feature one of the fabrics which I had a lot of. I was, however, limited in size by the fact that the only yardage I had left was the beige and a bit of this green. Well, I then worked up a couple of different images of this design. I loved this but didn’t really have enough of the blues. So another color way was chosen. I loved the brown tree trunks and the beige forest animals. 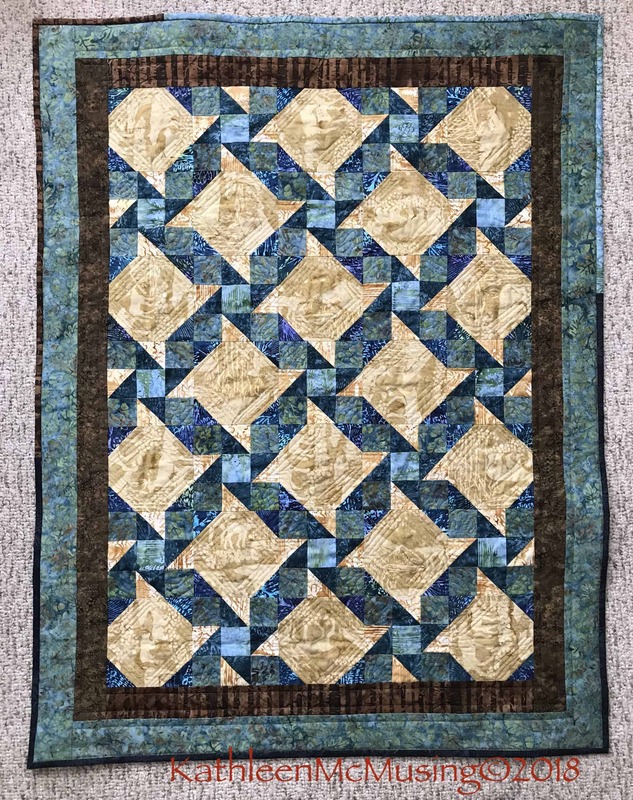 Rather than wind up with a winter quilt, I chose this design, which reminded me more of the lushness of the mountains and the stars in the sky at night. In the spirit of making all things difficult – I had to “squeeze” those half square triangles out of the strip sets. I used narrow seams, but they are seams, and the block finished at 1 3/4″! I also trimmed the strips down to make the square blocks. To top it off, I was short one pair of half square triangles, but I had some blue that I could piece and figured you wouldn’t be able to see it, unless I told you where it was! The finished block size was 5″. I loved the way it began to come together. As I looked at it, I could see three distinct patterns, you may see another. I pieced with my favorite Aurifil thread, the 50wt, in a beige #2000 and a a little darker grey beige, #5011 was used for the the bobbin and some of the quilting on the front. Hobbs Thermore was the batting I used. I am really enjoying this batting. It gave me no problem when I spray basted with 505 and used a modified Christa Watson technique with a portable design wall. In continuing the theme of making all things difficult, I wanted to use Island Batik for the back. Did I have enough to make it easy? No. How about binding – did I have enough? No. In the pieced binding is a bit of the light blue, the brown, and a blue black. Of course, I couldn’t even do the normal mitered join for the strips, I was that close!! I liked the blue in the binding as it draws your eyes to the center squares a bit, as the beige could be a bit overwhelming. So I used up nearly every last strip from the Jelly Roll making the back and binding. Those favorite ice blue strips didn’t quite work, but I am sure you will see them sometime soon. 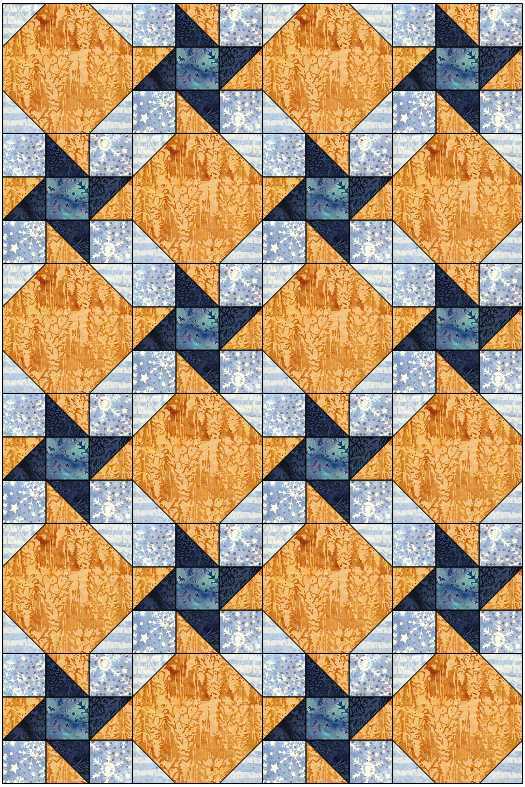 I am loving designing my own quilts and learning that I really need to understand the constraints of what I have as I design. I’m getting there and I am enjoying it. I violated so many rules: seam allowance, joining binding strips, not thinking ahead to bring the right fabric with me…. BUT I did it. You can too. This is an easy pattern, and I may write it up sometime, using proper amounts. It was doable – but not for the faint of heart! Previous Post July Island Batik Ambassador Box! 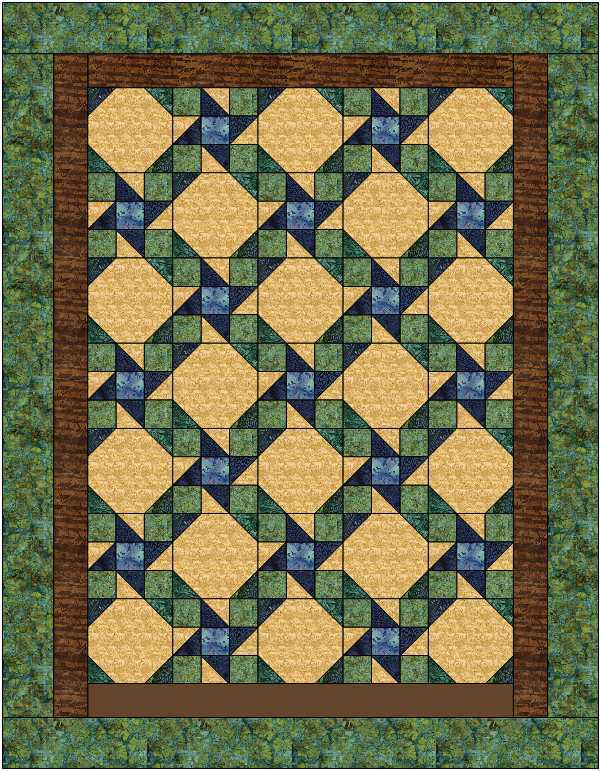 I love the name you gave the quilt and it is definitely fun to look at and find different shapes and patterns. I was toying with trying to name the saw blade – but the name came to me as I was writing the blog. There are so many ways to get patterns! It is one of the most fun part of the design process. It’s a very appealing design. I could see it in many colorways. Thank you, I loved the way it turned out! Too sweet, Abbie! Thankfully, the name came to me as I was writing the blog and I think it is reflective of the fabric and pattern. 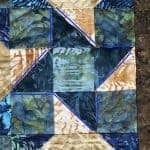 Wow, I never would’ve guessed there were so many close calls on this quilt if you wouldn’t have told us! I love the mountain look of it. Looks neat from the back, too! 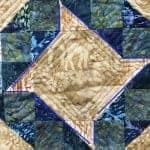 I know – sometimes a quilt just won’t let you set on your laurels and get it done. Glad that it did come together and worked out! It is funny how we can make it work when we want to. Sometimes it is a matter of inches and sometimes yards! 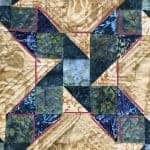 No one probably would notice but I think its good for other quilters to know how we solve problems, when we encounter them. It sometimes seems like we use our thinking caps more often than we would like! Thanks, Bea. I love the way the back turned out too. I should have told my moose story…but there will be an opportunity in January. Mitered joins in binding is a “rule”??? Never!! I always use straight seams in my binding! Great job making it work with what you had! Yikes! It’s not a rule, but my preferred way unless I am matching color lines in the pattern. It’s funny how when you go things that way 90% of the time it really sticks out. I have to learn to plan with the fabric I have not what I think I have. I was pleased it worked out. Thank you, I rather love it too! No Quilt Police here! I love that you pushed so many boundaries to get what you wanted and that you made it happen. 10 points for ingenuity. 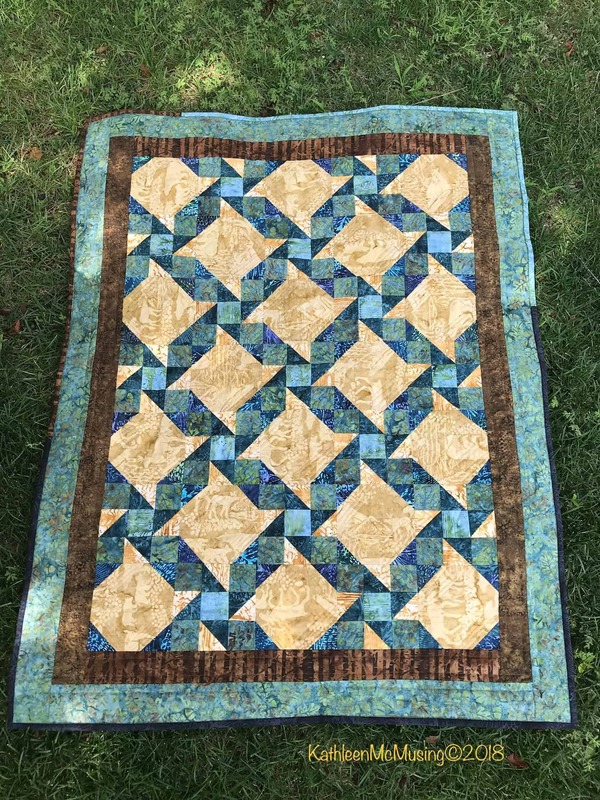 And another 10 for a beautiful quilt. Well done. I agree on the no quilt police – but narrow seams are a little frightening. This is one of the places that the challenge comes in for me – I know what I want to do and how to do it – but I miscalculate some piece or what I have in fabric – and I can’t easily go to the store and get it! Hoping I (we) sail through on the next one. Amazing how you made it all work! I love that persistence, and I LOVE THAT QUILT. Well done, and thanks for being the first person ever to link up to What I Made Monday! I absolutely love your quilt and your pattern. I love how the lighter stars move and how the smaller, darker ones peek out at us! Absolutely darling! Thank you for sharing! 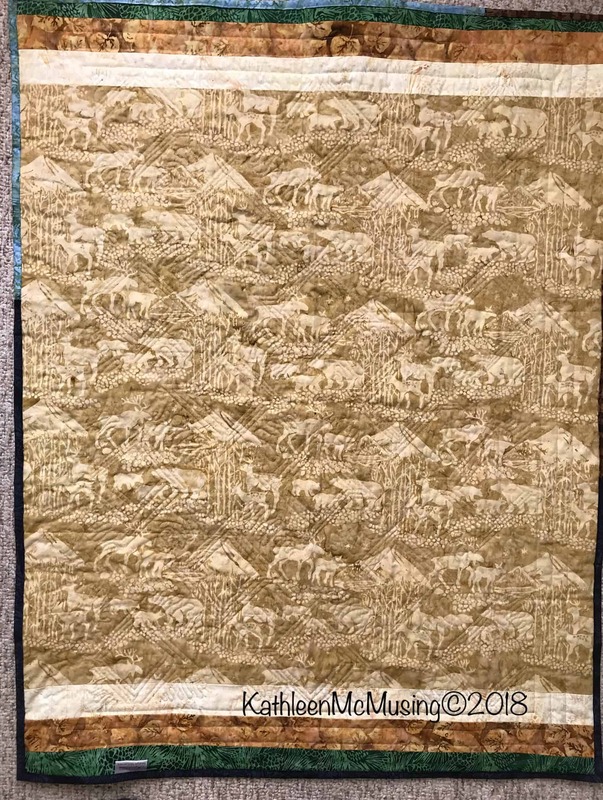 Beautiful quilt Kathleen! Thanks for sharing! Congrats on the finish! I love reading about your process and how you make every piece of fabric work for you. What is up for the fourth quarter of the FAL?